A Crowdfunder campaign for a world-first autonomous research ship intended to journey across the Atlantic in 2020 as part of the 400th anniversary of the Mayflower sailing has been launched at the University of Plymouth. The campaign is part of a funding drive to raise £10 million for the Mayflower Autonomous Research Ship (MAS), which is being created by the University, MSubs, the ProMare, and Shuttleworth Design. 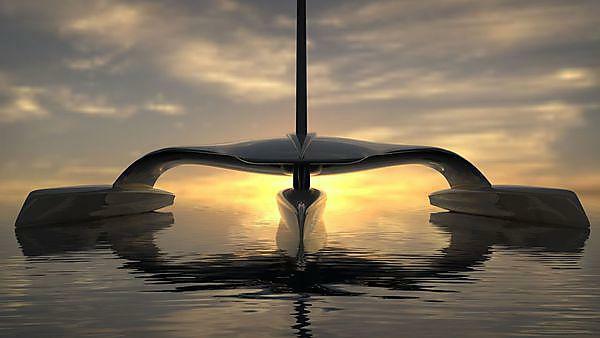 The MAS is currently in the design phase, and the trimaran structure is set to be 12 metres in length, and will use wind and solar power to make the crossing at speeds of around six knots. Designed to be entirely autonomous, it will be able to launch a number of underwater and aerial drones to help it conduct research along the route. Stakeholders from the city and members of the media attended the University's Marine Station to hear from some of the key players on the MAS project. "Plymouth is a city famed for looking forward and possessing a great spirit of adventure. And the thing about great historical figures such as Scott, Drake and Shackleton is that they all went into the unknown and they changed the world. So it is that the MAS is seeking to emulate that impact, creating history rather than re-creating it." A video showing an artist's impression of the ship - created by the University of Birmingham, also partners in the project - was played and details of some of the private sponsor options outlined. Brett Phaneuf, Managing Director of MSubs, and the Earl and Countess of Devon - who are supporting the project - also spoke at the event. "We are going to build an Autonomous Ship, the third Mayflower, and it will cross the Atlantic and commemorate that voyage 400 years ago but allow us to usher in a new phase of oceanographic and climatological research with state-of-the-art technology."